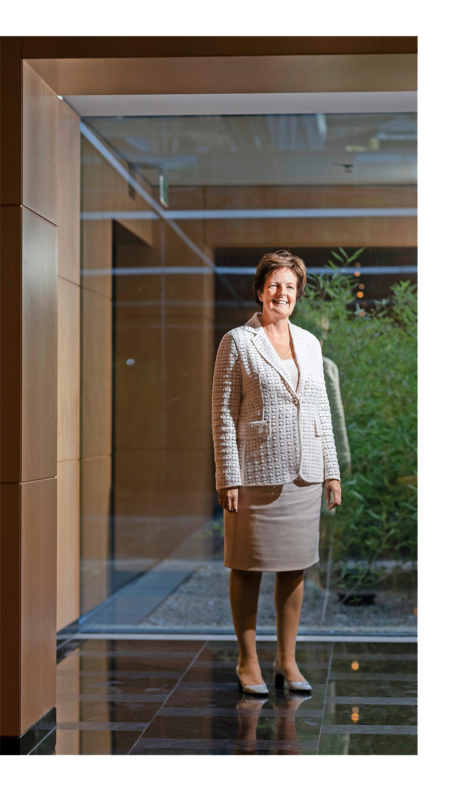 Chairwoman Jill Ader discusses the future of leadership in a feature with Wirtschaft Magazine. This feature originally appeared in Wirtschaft Magazine on November 18, 2018. At first glance she looks as if butter wouldn't melt in her mouth: Jill Ader's presence is precisely what one would expect of an Englishwoman: soft-spoken, a touch on the formal side, and with that typically dry British sense of humor. That said, the new woman at the helm of Switzerland’s largest executive search firm, Egon Zehnder, is highly unlikely to go down in the company's history as harmless. Even her appointment made waves: With her election to chairwoman of the executive search giant she made it clear that she is a past master of C-suite power games. In the race for the top job, Ader coolly and surprisingly left CEO Rajeev Vasudeva trailing in her wake. In the meantime, he is no longer CEO but just a partner at the firm. She's aiming to change quite a few things but hold fast to the values. Jill Ader took up her new role on November 1. As she did so, she also put an end to two traditions: Firstly, ever since the firm’s founding father Egon Zehnder stepped down eighteen years ago, the CEO has always gone on to chair this discreet executive search firm with its headquarters in Zurich. And secondly, Ader is the first woman ever to hold the top job at Egon Zehnder. A mother of three grown-up children, Ader hints at wanting to change quite a few things at the firm, which posts annual revenues of 670 million Swiss francs and is the global number three in the field of executive search. In order to do so, in the foreseeable future she will be moving to Zurich. In Switzerland, if not elsewhere, the firm has a relatively traditional, conservative, male-dominated image – for which in women’s business circles it occasionally comes in for private criticism. In a substantial article written a couple of years ago, business journal Bilanz referred to the corporate culture as being “almost like a religious order”. Ader considers the description exaggerated. And yet working for Zehnder is something like a mission. Speak with partners and consultants and you sense a certain conceit vis-à-vis the competition, from whom as a matter of principle no employees are recruited. Because in its executive search role, Zehnder works for fixed fees and not for a commission that depends on the annual salary of the successful candidate. That’s what the competition does and the people at Zehnder expressly distance themselves from a practice that tends to drive the salaries of corporate leaders even higher. “Egon laid down fantastic values that we are not about to change, and these include our system of fees,” says the new boss. The firm’s founding father, now 88, congratulated Ader on her election as they lunched together. It emerges clearly that as the first woman to head up Egon Zehnder, one major topic that Ader, who holds an MBA from the London Business School, is aiming to drive forward is diversity. While women are in demand for leadership roles around the world, and clients now invariably want to see female candidates included among those presented as potential CEOs, Egon Zehnder itself still has some ground to make up when it comes to gender parity. 24 percent of its partners are women. “Of course I’m not happy with that,” says Ader. As a manager herself, Ader knows from experience what women have to contend with in the attempt to deal successfully with both their profession and a family, and how wearing it can be. “When I had my third child I hit a crisis and began to doubt whether I would ever find my way back into my job,” she recalls. At the time, her husband encouraged her by saying that it was perfectly OK with him if she decided to stay at home. “Just knowing that I had the option of stopping work gave me strength,” Ader says. This poses new challenges for the executive search industry as a whole, given that it was geared to reviewing candidates for the top job in terms of their past performance and presence. Today, Ader says, they need to be examined in terms of how well they know themselves and how they approach their own weaknesses. “Most top managers are unaccustomed to dealing with their own vulnerability,” she says. And for Ader it is precisely this self-reflection that is a must for leaders who hope to succeed. This is why Egon Zehnder is aiming to expand its leadership advisory business. Executive search remains its core activity – an activity that is currently growing, above all in Germany, the USA and the UK, but in Switzerland too. But for a long time now Zehnder has also been focusing on the field of executive development, where the firm posted double-digit revenue growth last year. And Jill Ader is aiming to foster that growth.